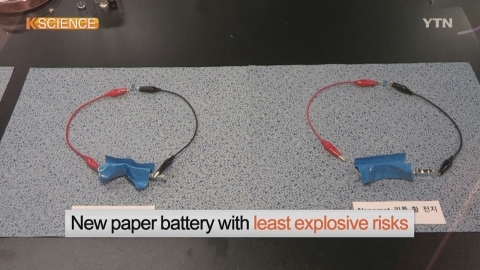 A South Korean research team has developed a paper battery without explosive risks, using wood cells. Applied with high pressure on it, the battery explodes with flames. Lithium-ion batteries used for various portable electronic devices are known to be vulnerable to heat and outside impact. In order to solve such vulnerability, the research team has developed a lithium-sulfur battery with least explosive risks by using wood. The plastic membrane of the existing lithium-ion batteries causes the blast, but the newly-developed paper battery solves the problem by using membranes made with nanocellulose from wood. In particular, the new paper battery overcomes shortcomings of the existing lithium-sulfur batteries which are widely regarded as the next generation battery. Besides, the paper battery lasts three times longer than the previous one and twice longer than the lithium-ion battery. The raw material price is one-35th of the lithium-ion battery. "The technology secures long-term usability, lightness, flexibility by using the properties of the paper sheet." The new battery is expected to be used for drones which require light batteries, as well as wearable devices that need foldable, windable and bendable batteries.